At Horgan’s Wedding Car Hire we fully understand when it comes to your big day we are fully aware that it is one of the most important days of a new bride and grooms life, which is why we will assist you through the process of selecting the right vehicle for your big day when you book your Wedding Car Hire in Altrincham with us. When you book Horgans Wedding Car Hire for your Altrincham Wedding be sure to get in touch with our team today. We will go above and beyond to ensure your day is memorable and special meaning you can always rely on us for the finer touches. Our Wedding cars are equipped with some of the finest cars which we have available for wedding hire in Altrincham including modern, classic and vintage cars for hire. The vehicles we have are complete works of art and have been used in television shows and in various promotions, when it comes to wedding hire in Altrincham, we will make sure you travel in style on your big day. 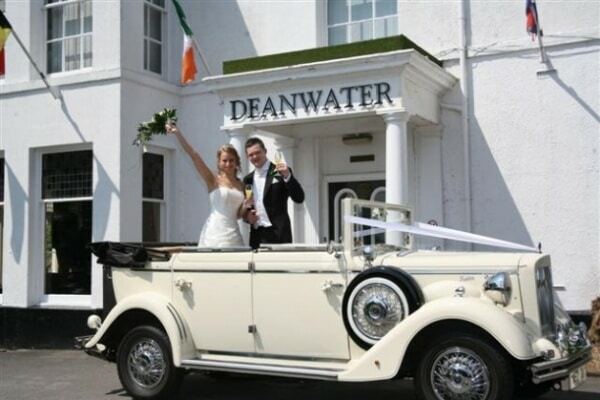 When it comes to our wedding car hire service, all of our chauffeurs are impeccable in appearance and time keeping. Your wedding chauffeur will be immaculately dressed in a smart suit and tie and will arrive at least 15 minutes before your appointment time, so you can be rest assured the finest start to your big day as well as easing your nerves. Wedding cars of distinction, beautifully co-ordinated with ribbons & bows to match your theme, our stunning cars and professionals’ chauffeurs offer the highest standard of service ensuring your wedding day is your dream day! Each individual wedding is unique and requires those special touches, we work with you, your photographer, other suppliers and your chosen venue to plan the entire schedule. As a newlywed couple it’s a must that you arrive in style to your venue and why not do this in a stylish and extravagant chauffeur driven car. When sitting in a chauffeur driven wedding car heading towards your venue you may be feeling a lot of emotions from tearful, to nerves, to butterflies in your stomach. The luxury, relaxing and comfortable environment of chauffeur driven wedding cars help you to overcome all of the stress and anxiety so that you can enjoy a blissful ride to your destination. A chauffeur driven car adds elegance and style to your wedding, it goes without saying the bride is the centre of attraction at a wedding and all guests are more than excited to see her big arrival. Arriving to the church or reception for marriage in a tremendous chauffeur driven wedding car looks elegant, stylish and majestic, giving your wedding that wow factor. One of the best things about hiring a chauffeur driven car is that they are driven by trained, professional, experienced and mannered chauffeurs. Chauffeurs are professionally trained and experienced to provide you with the best wedding car experience. Chauffeurs are professionally attired, are skilled drivers and can efficiently deal with stressed brides, getting them to the church on time and in a safe manner. No matter how exciting planning your wedding is, it can also be a very stressful time, as there are a lot of wedding related matters to deal with including hiring a wedding car and then finding a suitable driver. The hunt for the perfect car and driver can be tiring and time consuming when there are other elements to your wedding which need sorting. This is why chauffeured weddings can help you save time and energy. Everyone fears that mismanagement in particular aspect of your wedding may spoil magic of your wedding. It is always better to hire a reliable company offering chauffeured driven cars as it will be responsible for preparing your chosen car according to your selected theme, for the décor and providing a professional chauffeur along with the car. It will be the company’s duty to ensure that your wedding cars is fully maintained inside and out and getting the bride to her wedding on time and safely. We have been offering our chauffeur driven wedding cars to customers throughout Altrincham and the surrounding areas for many years. At Horgans Cars, our wedding cars are in demand thanks to our excellent reputation. When you choose Horgans Cars for wedding car hire, we will ensure you receive a first-class journey to make your day that extra bit special. 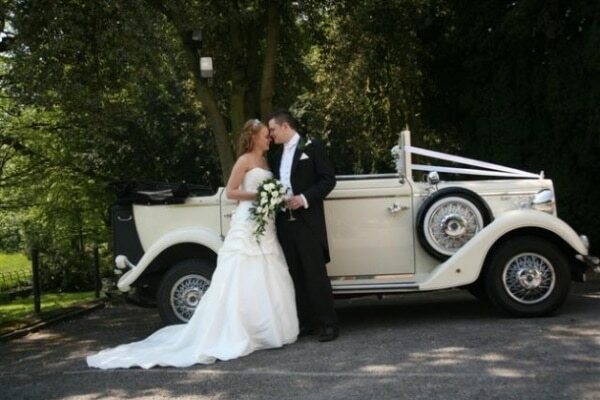 Our luxury wedding car range covers everything from Beaufords to Bedford coaches and many more. If you are looking to book your wedding car for your big day, then why not discuss wedding car hire in Altrincham with Horgans Cars today. Should you require a first-class wedding car hire service in and around the Altrincham area then be sure to contact the team at Horgan’s Wedding Car Hire today. We are proud to have a team of highly trained chauffeurs who provide a safe, reliable and overall efficient service. Our standards are proven and recognised through customer testimonials and referrals where some of our work comes from. Not only do we provide a range if wedding cars in Altrincham, we also offer personal chauffeur driven services. After we’ve picked you up from your chosen location, we’ll safely transport you to your wedding destination, ensuring that you look spectacular as you arrive.